Using emotiv neuro-headset to control the Angry Birds game. Mapping mouse movement and mouse left button click using emotive EmoKey KeyMap and GlovePIE. 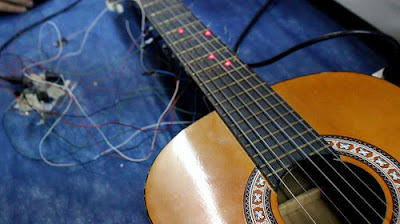 A Guitar which light LEDs to instruct you which string to fret and where to place your fingers. The guitar was built during a 36 hours weekend at GeekCon conference.